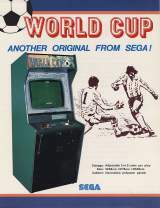 World Cup © 1978 Sega Enterprises, Limited. Discrete logic soccer game. Two players use a trackball to move soccer players across the field and pass the ball or shooting a goal by pushing the trackball. If an opponent moves their player on top of the other player, the ball is stolen. 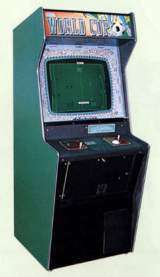 The player with the higher score at the end of the game (which lasts from 60 to 90 seconds) is the winner. World Cup has kick off whistle, applause and cheering sound effects.